Customer expectations - whether consumers, citizens or business customers - for relevant, personalized and consistent interactions are soaring. Catalysts like social media, real-time access to information and the growth of mobile devices are redefining what customers expect. According to an IBM study of over 1,700 Chief Marketing Officers, strong consensus exists among senior marketers across the world that these trends are fundamentally changing how marketing must work in order to drive business success. Big challenges for today's marketers, but bringing science to the art of marketing with information technology can help you address this. 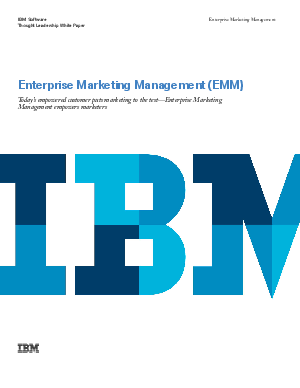 With end-to-end enterprise marketing management solutions from IBM, you can transform all aspects of marketing to engage customers in highly relevant, interactive dialogues across digital, social, mobile and traditional marketing channels.